Is anyone else a watch girl, or is that just me!? I had a Betsy Johnson watch that Blake bought me that I wore EVERYDAY for 3 years! Then, I moved on to a Kate Spade watch that I wore for a year and a half, until the battery died and I was too lazy to go have it replaced LOL. And now, I have grown into a JORD watch girl!! I've had this beauty for a week now, and it just fits so perfectly into my style!! The natural wood band (that seriously smells like cedar y'all) works perfectly for the millennial life I live! *I can just see my dad cutting his eye over at me now* And the champagne colored face just screams "Rachel"!! It's sophisticated, yet fun... It's classy, yet trendy... It's natural, yet hand-crafted... It's everything I love!! These beautiful time pieces would be the most amazing, most thoughtful Mother's Day gift ever (maybe #2 after a massage, though)!! My mom was telling me just the other morning at brunch how elegant she thought it was! And with all the color options, there is sure to be one that your mom will love as well!! I mean, who gave birth to you, who changed your diapers, taught you to pee in a toilet so you could fit into normal society, packed every lunch, came to every game, is your biggest fan, the first to like all your Facebook posts, and the first person you call when you need something...? 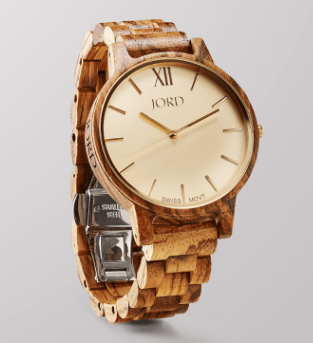 So, do something extra special this year, get her a JORD watch!! And let me help you do that - at the bottom of this post is a giveaway for a $100 gift certificate to JORD!! And even if you don't win that ultimate grand prize, ALL entrants get a $25 gift certificate!! How great is that!? JORD puts their watches into the most beautiful packaging, so you don't even have to go through the effort of wrapping it! And if you have ever been in my life around a holiday or celebration of any kind, you know that for me, this is a selling feature all on its own!! It comes complete with this wooden box and burlap pillow, they custom size it before they ship it, they send a brush and cloth for cleaning, and they ship it super quickly!! There is nothing better than stellar customer service... Can I get an AMEN!? So, if you're having any doubts on what to get your mom for Mother's Day, take it from this fashion blogger that a JORD watch would be PERFECT!! 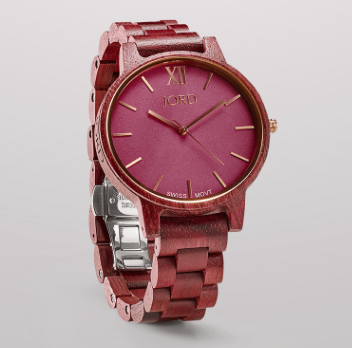 Or if you are having any doubts about "what to get your mom for Mother's Day" *wink wink* a JORD watch would be perfect for that as well!! *This giveaway will run through April 30th. JORD will chose the winner and email everyone with the appropriate gift certificate amount! Good Luck to all! !